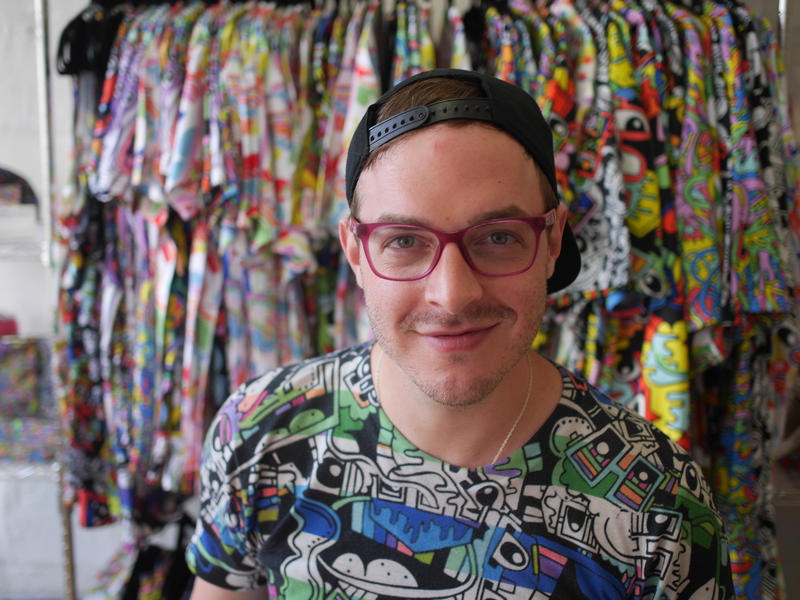 If you noticed the extra jazz of color on any of the +20 Rag and Bone stores during Pride Week, that was Tyler Wallach. He’s also worked with Habitat for Humanity, and is about to dress Tammi Brown from RuPaul’s Drag Race. But why does the lovechild of Lisa Frank and Keith Haring focus predominantly on t-shirts and offer them in inclusive sizing? Find out below. Q: How did you initially focus your work and what made you settle on shirts? Q: What is your process for designing a new shirt? Tyler: High resolution photographs of my paintings are then edited, cut, tweaked and turned into a pattern in Photoshop. I then format the files into templates for the various items I want to design!! Q: Nice. I read you were initially inspired by cartoons and music. Are those still the main sources of inspiration? What inspires the subject-matter of your pieces? Tyler: Seeing the cartoon Adventure Time was a huge moment for me, I love all the episodes but especially episodes involving Tree Trunks. I think the SHROOMS episode of Broad City is pretty freakin’ awesome, I’m a huge fan of Mark Perry. I also recommend watching a full season of AHHH! REAL MONSTERS and Rocko’s Modern Life. Q: Fashion is an industry that has more out LGBTQ members than others, like Tech. But there still are closeted people within fashion. How does being gay reflect your designs and your brand, and what do you hope to achieve? Tyler: Good question. A lot of people have told me that I, “shouldn’t lead with the gay thing if you want to be taken seriously….” but I just don’t agree. I want to make sure it’s known that my art and the clothing it spawns is just as queer as I am. I always say, Tyler Wallach Studio isn’t just for everybody, it’s for every. body. Q: When did you sell your first shirt? Tyler: I guess….hmmm….it was June 2013! Q: How has your work evolved since you first launched? Tyler: I’ve had enough time to make mistakes and learn from them and become a better and more streamlined business owner. Q: How do you define success for yourself? Tyler: As India Arie says “…success is clarity of my intention and reaching that intention while being true to myself and with joy. Q: How did the Rag and Bone opportunity come about? What was the collaboration like? Tyler: I was connected with Rag and Bone via ART ACTVST, a company working to connect authentic artists with brands to fight for causes involving social and civil justice. Everything I do with my art is connected with social causes, so it was a perfect fit for a collaboration. I worked directly with the window design team at Rag and Bone, they were fantastic! Q: That’s great. What was Rag and Bone hoping to achieve with the collaboration? Q: That’s amazing! What other projects have you worked on that mean a lot to you? Tyler: Designing the 2018 Pride shirt for Habitat for Humanity NYC, Volunteering for The Museum of the Arts and painting a mural for (RED) during a female empowerment conference. Q: What have you learned from your obstacles? Tyler: If you don’t take yourself seriously, nobody else will either. Q: Amen. Do you have any mantras? Q: What’s next for the brand? Tyler: Awesome new solo art show and some new fashion looks and prints!!! AND I’M GONNA DRESS TAMMIE BROWN FROM RUPAUL’S DRAG RACE I AM SO PUMPED!!!!! You can check her out at Drag Con LA 2019. Q: What brands or designers should we follow on Instagram right now and why? Tyler: My girls @JPAPANYC @FarradasKnits they are both such talented designers in totally different genres of clothing but they’re both just such amazing people, the fact that they are also badass female designers, is sprinkles on-top!! Also Sam at @TenYardsClothing is a magician with jewels and fabric and @ZachGrearArt because his drawings are so wonderfully queer. Q: What do you think of a website that features only brands created by people of color, women and/or the LGBTQ community? Tyler: I think it’s great! The more exposure, the better! Down with Tyler but stranger to Jinjin, Fátima, and Mriga? Drop your email on the line to get the origin stories of brands run by women, people of color and LGBTQ.